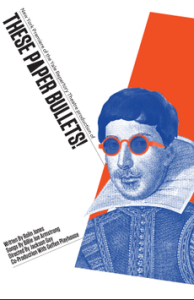 For everyone who’s wondered what might have happened if Shakespeare had met the Beatles, These Paper Bullets! delivers “a modish rip-off of Shakespeare’s Much Ado About Nothing with a serious backbeat.” I saw one of the last scheduled performances of the play, by New York’s Atlantic Theater Company, and it was a delight. Despite a few wobbly bits, it stands on its own as a story—but it’s also salted with plenty of in-jokes and references for Beatles fans. And the original songs, by Billie Joe Armstrong of Green Day, are outstanding. The play originated with the Yale Repertory Theatre, and its book was written by Rolin Jones, who came up with the idea of mashing up Much Ado and the Beatles of the A Hard Day’s Night era. Anyone coming to the play expecting a production of Much Ado with an updated setting would be disappointed: Jones drops some parts of the plots, expands or radically reshapes others, and dispenses with most of the Bard’s language. But These Paper Bullets! works beautifully as a looking-glass version of the Beatles’ story. 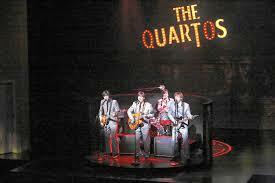 Jones takes the four leading male characters of Shakespeare’s play and makes them the Quartos (Ben, Claude, Balth, and Pedro = John, Paul, George, and Ringo). The play is driven by the course of Ben’s and Claude’s love affairs, which experience the sort of complications typical of Shakespearean comedy. 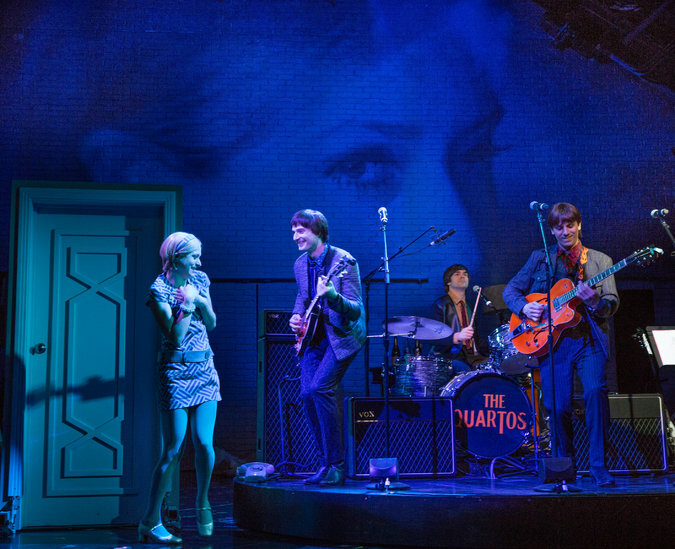 The production takes off whenever the Quartos perform: the sets are perfect for the mid-60s, and the band gets a lit-up sign that recalls the one in A Hard Day’s Night. Most importantly, Armstrong’s songs manage to evoke the Beatles powerfully without parodying their work. “Regretfully Yours,” which Claude performs near the show’s end to win back his love, stands out as believably McCartneyesque and spot-on for the play’s action. One of the refreshing changes Jones rings on Shakespeare’s play is increasing the power of the female characters. In an interview with the New Haven Register, Jones explains that looking at the play’s action through a 1960s lens inspired him and his collaborators to amp up the female characters’ importance. Director Jackson Gay says that “We made (the women) successful and gave them options similar to our character Ben” by making Ben’s love Bea a renowned fashion designer and Claude’s beloved Higgy the “it” model of the day. Nicole Parker’s Bea and Ariana Venturi’s Higgy are two of the cast’s highlights, with Parker in particular having a high old time giving Ben the sharp edge of her tongue while wearing some killer miniskirts and boots. These women demand respect, and the Quartos are compelled to give it. Claude (Bryan Fenkart) serenades Higgy, while Ben (Justin Kirk) plays guitar and Pedro (James Barry) keeps the beat. Playing Ben, Justin Kirk has a presence and slyly mocking look that recall Lennon’s, and he believably delivers the dry wit of his lines. Bryan Fenkart’s Claude is a more stereotypical figure, but especially in the climactic scenes with Higgy, he develops some of the play’s deepest emotions. In a smaller role, Adam O’Byrne, who plays the villainous Don Best, takes what might have been a one-note character and makes us feel his betrayal and confusion. While you can’t root for the success of his plot to take revenge on the band for firing him in a back-handed way, you can’t hate him either. Bea and Ben rest after a burst of repartee. But taken as a whole, These Paper Bullets! 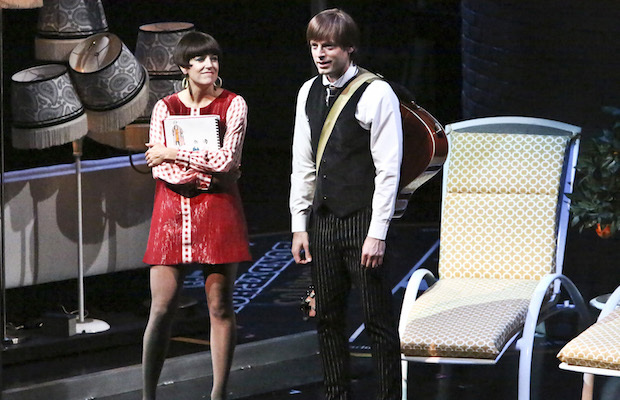 is a triumphant marriage of Shakespeare and the Beatles. The ending, in particular, is both hilarious and touching. This being a comedy, of course all the nefarious plotting by Don Best et. al. is revealed, and Ben’s and Claude’s love relationships get sorted out. The most genuinely moving moments, however, come not from the romantic plots, but from the relationships among the Quartos. When Don Best’s quest for revenge is revealed, new drummer Pedro admits they should have spoken to him directly about his being replaced, rather than pushing the task off on their manager, and the other Quartos agree. This scene directly addresses what I’ve always seen as the Beatles’ Achilles heel– their tendency to duck out of honest encounters that would put them in a painful position, even when such an encounter is clearly necessary. Jones’ acknowledgment of the dark side of the Beatles’ privilege deepens the show and prevents it from becoming an exercise in uncritical celebration. Most fittingly, the play’s emotional climax comes, not from the resolution of Ben’s and Claude’s respective love stories, but from their reconciliation. Earlier in the play, when Ben and Claude find themselves on opposite sides of the did-Higgy-cheat-on-Claude question, Ben “goes solo” and refuses to have anything more to do with the band. At the very end of the play, after all else has been resolved, Claude asks Ben if he will come back to the Quartos. There’s a beat or two of silence and tension before Ben answers “Well, we can’t be the Quartos without four of us, can we?” It’s when Ben rejoins the band and he and Claude embrace that the story’s emotional arc is finally complete. As with other Shakespeare comedies, the scene is a window into what might be possible in another, better world. Right–as we like to say in Chicago, make no little plans. Here’s hoping These Paper Bullets! gets another round in theaters, and perhaps a tour. the songs by Armstrong have more of a flow than some Beatle-inspired songs. That is a lovely song. It reminds me a little of Please Please Me. I absolutely love Billie Joe Armstrong. This play looks great Nancy. Thanks for posting this. I saw that, too, on Jeopardy, @Hologram Sam. Could not believe it! Great review, and I’m glad to find this blog. Never heard of it before, but I’d gladly read anything Nancy writes!